The traditional, beating heart of Frankfurt’s food scene set along Hassengasse is a treasure trove with the perfect mix of ingredients, experts, tales and stories. A beacon of yesteryear in look, it still retains its 1960s style but this recently modernised market is still standing on the position of an open air market that pre-dates the building by hundreds of years! Sadly flattened in WWII, it was reconstructed throughout the Fifties and re-opened in the Sixties in the popular Art Deco style of the time. Spread over two floors, it bears a mix of international cuisines and time-honoured local stalls. 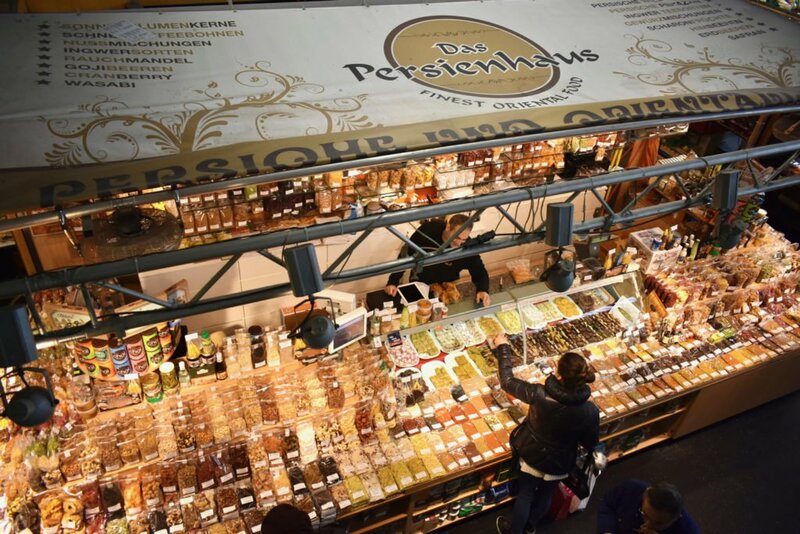 Kleinmarkthalle is still where so many locals buy everything from exotic delicacies to daily provisions from over 60 stallholders who have been commanding their patches for decades – 10 of which have been there since the start. Check it out here. 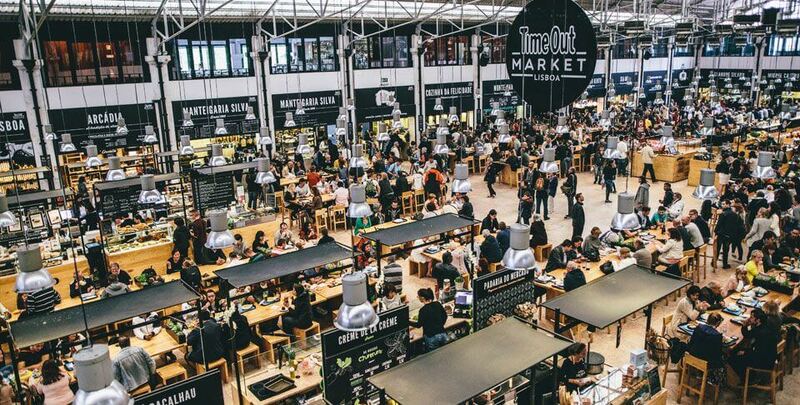 A curation of some of the city’s best restaurants, Time Out Market Lisboa is the market you wish you could find in every capital city you visit, boasting a delicious line-up of local restaurateurs, dining concepts, bars and stores, arguably showcasing ‘Lisbon’s best’. Setnear Cais do Sodré station, you’ll find this market (also called Mercado da Ribeira) with square stalls set around a large, central communal dining area filled with hundreds of seats and long tables. Wrapped around, you’ll find the likes of a gourmet croquette stand, an outpost of SEA ME, a gourmet burger bar, Manteigaria pastelaria and much more. We particularly loved the offering from chefs Miguel Castro E Silva and Henrique Sá Pessoa whose expansive menus each totally blew us away. These places turn the idea of market dining on its head and shatter the illusion of street food having to be limited. Check it out here. What can one say about Borough Market? Having lived in London for just shy of five years, Borough Market is the beacon of food in London. One of the most sublime examples of a food market in any city in the world, it’s a mix-match of traditional fruit and veg traders, continental cheeses, street food stalls, tiny restaurants, bakeries, coffee shops and also holds within a demo stage, a cookery school and homewares shop. All this set under the railway arches a stone’s throw from London Bridge. If you visit London, Borough Market is a must-stop, but word to the wise: Friday and Saturday afternoons are always packed, mid-morning or late afternoon are always best. Open six days a week, we’d suggest visiting on a weekday to get the best experience. Definitely try Bread Ahead Bakery for amazing doughnuts, Monmouth coffee shop for a café au lait, Brindisa for Spanish charcuterie, Pâté Moi, Comptoir Gourmand and take your pick from one of the hot food stalls like Horn Ok Please or Balkan Bites. Check it out here. Sweden’s third city, down at the southern tip of the country, is easily accessible via Copenhagen and Gothenburg airports and is the capital of the Skåne region which is known as the ‘larder’ of Sweden – where much of the large country’s produce comes from. 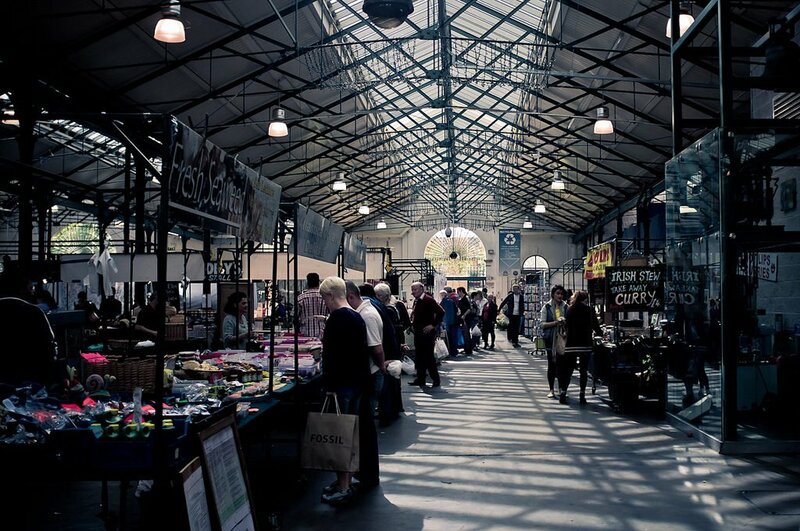 Malmö is a young, vibrant and eclectic city and its market is no different, open seven days a week from 10/11am daily. 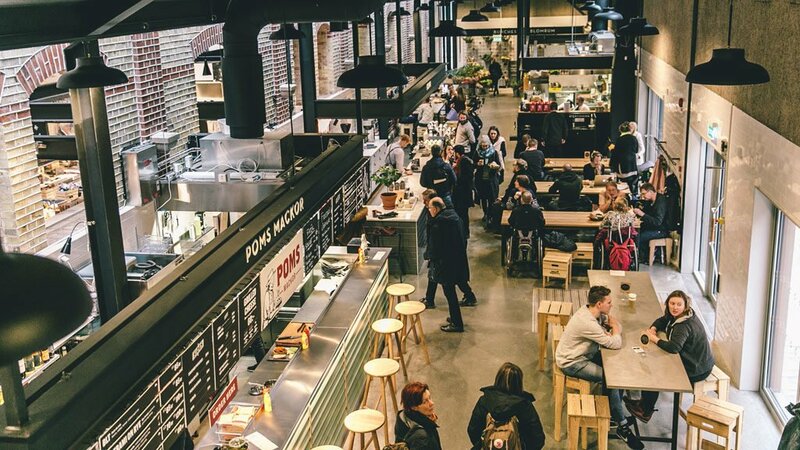 Most Swedish cities have a Saluhall within, a central, covered market filled with butchers, bakers, cheesemongers and restaurants and cafes, and the Malmö one is set in a beautiful modern building in the industrial area of the city a couple of minutes walk from Centralstation. Self-described as a “food lover’s paradise”, here you’ll find sausages hand made in a barn without electricity, plaice that is only caught when it’s high tide around the small island of Ven, knives so sharp they can slice bone marrow, hand-roasted premium coffee, fresh falafel and the finest chocolates amongst many other edible treasures, as well as lots of food options including a Champagne and seafood bar, a wood-fired pizza place and a bakery appointed with the freshest bread and bullar (buns). Check it out here. Ireland is well-served by two historic market buildings in particular – Cork’s English Market and Belfast’s St. George’s Market. 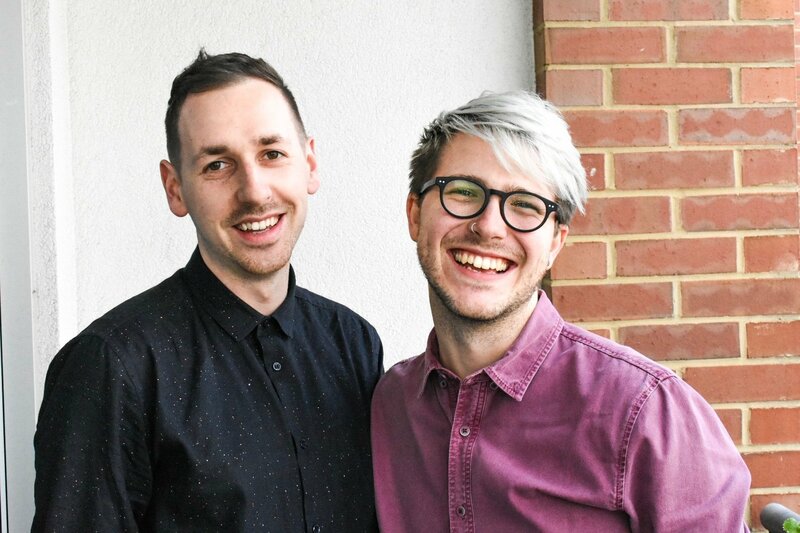 The latter is one which is a little harder to experience due to very specific opening hours, but if you manage to squeeze in it’s truly an experience. Only open Friday, Saturday and Sunday and opens early and then closes early at 3/4pm each of those days, but inside you’ll find a hodge podge of different stalls from curtains and belts to fishmongers and tea traders. There’s been a market on the site on East Bridge Street since the early 1600’s, but this grand Victorian building the market sits within now dates back to 1890 or so, most recently refurbished just before the Millennium. Check it out here.